A few decades ago I stopped smoking, and soon gained about 40 pounds. Not wishing to lug all that extra baggage around, I decided to back off eating. Actually, I would have quit eating if I thought I could get away with it. The more I lost, the less I needed to eat to maintain whatever weight I was at the time. I always figured that my body was just being more efficient with the reduced calories. Of course it was. However, this bit of research tells me that thinking I was eating less may have played a large role in my metabolic efficiency. Here’s the evidence: A Milkshake Experiment. Well, isn’t this just another reason not to trust thought to enlighten! This short NPR radio segment gives more background on that Milkshake Experiment: Mind Over Milkshake: How Your Thoughts Fool Your Stomach. Science comes to the rescue, again! Although, I say that a little tongue in cheek. More accurately, science ends up proving what small ‘t’ Taoists have known for millenniums. Science just needs to prove with irrefutable evidence some of these things before we can really begin to accept them. I don’t mean we’ve known the placebo side of milkshake per se, but rather the unreliability of thought. Chapter 71 echoes this: Realizing I don’t know is better; not knowing this knowing is disease. The difficulty is that reality often goes against common sense (i.e. the bio-hoodwink). There is also the problem of not wanting to believe whatever goes against what we desire. It requires the impartial guns of science to take on this cognitive battle. SPIEGEL: Who among us has not had this moment, that kind of intimate tête-à-tête with the nutritional label searching salt, sugar, fat? Trying to discern how will you affect me, are you good or are you bad? But here’s the thing you probably haven’t considered. How does the label itself affect you. ALIA CRUM: The labels are not just labels. They evoke a set of beliefs. SPIEGEL: This is a psychologist named Alia Crum who works at Columbia University. And a couple of years ago, she found herself seriously considering what on it’s face seems like a pretty strange question. She wanted to know whether the information in a nutritional label could somehow change what happens to you biologically. CRUM: Whether these labels get under the skin literally, so they don’t just effect perception and taste and behavior but actually effect the body’s physiological processing of the nutrients that are consumed. SPIEGEL: See, Crum had spent years studying the placebo effect, how a sugar pill can physically change a body if the person taking believes that the sugar pill will change their body. And she figured that food labels might work the same way. And so, to test her idea, Crum created a huge batch of milkshakes. CRUM: It was sort of a French vanilla flavor. CRUM: It was delicious, in my opinion. SPIEGEL: Did you taste it, you know, just for science? CRUM: I did taste it for science. SPIEGEL: Then she took that single batch of milkshakes and gave them to groups of people labeled in two very different ways. 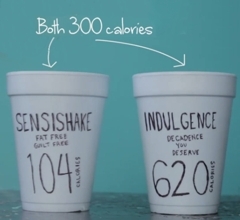 Half of the single batch of milkshakes was put in a bottle that was branded as a low calorie drink. CRUM: Called Sensi-Shake. And do you want me to read the label? CRUM: Says zero percent fat, zero added sugar, and only 140 calories – guilt free satisfaction. SPIEGEL: The other half of the single batch was put in a bottle that was branded as an incredibly rich and delicious treat. CRUM: Indulgence is the name of it. And the subscript is: decadence you deserve. SPIEGEL: With an extremely high calorie count. CRUM: Six hundred and twenty calories. CRUM: Six hundred and twenty calories in the Indulgent shake and 104 calories in the Sensi-Shake. SPIEGEL: And then both before and after the people drank the shake – which, by the way, was actually a 300 calorie shake – nurses monitored their levels of this hormone called ghrelin. CRUM: Ghrelin is a gut peptide. It’s secreted in the gut. People in medical field call it the hunger hormone. SPIEGEL: Basically, when you haven not eaten anything, ghrelin levels in the stomach rise which signals to the brain that it’s time now to seek out food. CRUM: It also, interestingly, slows metabolism. So rises in ghrelin signal hunger and slows metabolism, just in case you might not find that food. SPIEGEL: But after that rise, say you have a big meal. CRUM: Hamburger with cheese and French fries and a milk shake, gherlin levels are going to drop a lot. And what that does, is it signals to the mind, you’ve had enough here, you know, and I’m going to start revving up the metabolism so we can burn these calories were just ingested. SPIEGEL: On the other hand, say you only have a small salad, your ghrelin levels wouldn’t drop that much. CRUM: They maybe would just drop a teeny bit. And what that would signal is, you know, a combination of, mm, I’m not feeling physiologically satiated, maybe you need to eat more food. SPIEGEL: And the metabolism doesn’t get revved up in the same way. Now for a long time, the idea has been that these fluctuations in ghrelin levels were responses to the actual nutrients that the ghrelin met in the stomach. So put in a big meal, ghrelin responds one way; put in a small snack, ghrelin responds another. The thing that was believed to be important was the actual content of the food – not your beliefs about that food. CRUM: The label wouldn’t matter. SPIEGEL: But in her milkshake study, that is not what Crum found. If you believed that you were drinking the Indulgent shake, your body responded as if you had just consumed three times more food. CRUM: The ghrelin levels dropped about three times more when they were consuming the Indulgent shake – or thought they were consuming the indulgent shake – than when they were consuming the sensible shake or thought they were consuming the sensible shake. SPIEGEL: Is that a big difference? CRUM: That’s a big difference. Yeah. It’s both statistically significant also, you know, practically meaningful, considering that it was three times the drop. SPIEGEL: Which, at least for me, raises a pretty profound question. So does that mean that the facts don’t really matter, it’s what we think of the facts that matter? CRUM: I don’t think I would go that far yet. There’s a lot more tests that we need to do to figure out, you know, how much do the nutrients matter and how much does our mindset matter? CRUM: Our beliefs matter virtually in every domain, in everything we do. How much is a mystery. And I think that we haven’t given enough credit to the role of our beliefs in determining our physiology, our reality. You know, we have this very simple metabolic science; calories in, calories out. People don’t want to account for the fact that our beliefs matter too. But they do, and we’re finding that more and more the more that we research and explore these topics. But wait, when I eat a full meal, I get tired. I call it “food coma.” Then when I go for a walk, the food coma lifts and I feel energetic. Then again, when i eat less and exercise more, I lose weight. That doesn’t require belief. I think I’ll just eat and walk.